A multidisciplinary approach to care, including involvement of nephrologists, renal dietitians, and nurses, should be initiated early in the disease. 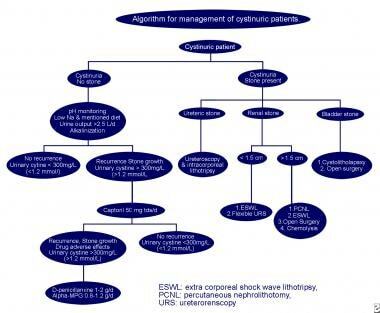 Treatment of the patient with cystinuria requires close cooperation between the urologist and the nephrologist. Maintaining high diuresis of 2.5 to 3 L/d or more, regularly distributed throughout the night and day, even when sulfhydryl compounds are given, appears to be the major factor predictive of therapeutic success. Regular clinical, radiological, and biochemical surveillance appears to be of primary importance to maintain good long-term compliance with medical treatment. Overall, for a patient with cystinuria who does not have a stone, first-line therapy in most cases is a conservative approach, including large-volume fluid intake (urine output >2.5 L/d), regular urine pH monitoring (urine pH of 6.5 to 7), dietary restrictions, and urinary alkalization with potassium citrate. If this standard therapy fails to achieve the urinary cystine concentration of less than 300 mg/L, then medical therapy with D-penicillamine, alpha-MPG, or captopril must be added. Treat patients with stone disease according to the location of the stone. The expertise of a urologist and a radiologist is important for decision-making processes, and stone site and size also influence further management. See the treatment algorithm image below. The goals of hydration therapy are urine volumes in excess of 2.5 L/d. This goal may require ingesting up to 5 L of water per day. Patients should drink 240 mL of water every hour during the day and 480 mL before retiring and at least once during the night. Patients should monitor the specific gravity of their urine using reagent strips, with a goal of achieving a value less than 1.010. Alkaline urine can prevent the precipitation of cystine calculi and can even aid in dissolution. Urinary pH must be more than 7.5 for stone dissolution to occur. Alkalizing beverages such as mineral water, rich in bicarbonate and low in sodium (1500 mg HCO3/L, maximum 500 mg sodium/L), and citrus juices are preferred. Paradoxically, a urine pH level of more than 7.5 can cause a predisposition to the formation of calcium phosphate calculi. For stone prevention, urinary pH must be maintined at 7-7.5. No interference from common medications, nutritional supplements, or blood has been observed with StoneGuard II. It also has a pad to measure specific gravity over a range of 1.000-1.030. Potassium citrate is the first-line alkalinizing drug. The typical adult dose is 60-80 mEq/d divided into 3-4 doses (15-20 mL/d), titrating the dose as needed to maintain a urine pH within the target range of 7-7.5. Acetazolamide inhibits the brush-border carbonic anhydrase of the proximal convoluted tubule, thereby increasing urinary bicarbonate excretion. Acetazolamide is not widely used as a first-line drug and is of questionable efficacy. Sodium bicarbonate was used in the past for alkalinizatoinbut is no longer recommended as a first-line agent. The sodium ion may actually increase the amount of cystine excreted. Cystine-binding and cystine-reducing agents share the ability to dissociate the cystine molecule into disulfide moieties with much higher solubilities than the parent molecule. These drugs are thiol derivatives. The treatment goal is excretion of less than 200 mg/d of urinary cystine, and this must be monitored yearly. Start these agents when hydration, dietary, and alkalinization therapies fail. Cystine-binding agents can dissolve cystine calculi, but this feat usually takes many months to years. They are best suited for stone prevention after surgical debulking of the stone burden, and they possibly help soften cystine stones in preparation for ESWL. Penicillamine is a first-generation chelating agent that combines with cystine to form a soluble disulfide complex (50 times more soluble than cystine), thus preventing stone formation and possibly even dissolving existing cystine stones. Three types of isomers of penicillamine are known and include D, L, and DL. Only the D form should be used clinically. The effect of the drug is dose dependent. A 250-mg/d increase in dose decreases the urinary cystine level by 75-100 mg/d. Doses of 1-2 g/d are effective in reducing the urinary cystine level to 200 mg/g of creatinine. The prevalence rate of adverse reactions is approximately 50%; therefore, routine use is limited. Adverse effects include rash, arthralgia, leukopenia, gastrointestinal intolerance, and nephritic syndrome. Long-term therapy may lead to vitamin B-6 (pyridoxine) deficiency. Thus, vitamin B-6 supplementation (50 mg/d) is needed. The drug is not excreted in the urine, so the cyanide-nitroprusside test is an effective qualitative screening method for monitoring the control of cystinuria. A positive test result indicates the need for an increased dosage. Bucillamine (Rimatil), a dithiol compound, is a third-generation chelating agent that has been available only in Japan and South Korea. In vitro studies showed that incubation of L-cystine with bucillamine and tiopronin resulted in substantially lower L-cystine levels than with tiopronin alone. When used for treatment of rheumatoid arthritis, bucillamine has shown a low toxicity profile. Therefore, it is probably well tolerated by patients with cystinuria. Surgery is indicated for patients with large calculi that are unlikely to dissolve and those with calculi that are causing obstruction or symptoms. Smaller stones can be monitored as part of an aggressive medical treatment plan, with the hope of dissolution and/or spontaneous passage. The ultimate goal of surgery is to make the patient free of stones. While the risk of recurrence is unchanged, the time to recurrence is significantly lengthened. ESWL is especially effective for cystine stones smaller than 1.5 cm in diameter, although overall stone-free rates are lower than those for stones of other composition. Because of their hardness and homogeneous amino acid composition, most cystine stones require two to three times the usual number of shocks to adequately fragment the stone. Multiple treatments are often necessary to achieve acceptable stone-free rates. ESWL is appropriate in the treatment of ureteral cystine calculi. Stones not visualized after fluoroscopy can still be opacified by either retrograde or intravenous contrast administration to allow for lithotripsy. Patients taking thiol derivatives may have cystine calculi that are more fragile because the cystine is replaced by apatite in approximately 30% of cases. These calculi may be easier to treat with ESWL. Historically, retrograde endoscopic treatment of cystine calculi was associated with complications and a low success rate compared with stones of other composition of equal size and location in the urinary tract. This was largely due to technical limitations in scope design and the failure of electrohydraulic lithotripsy to adequately fragment stones. Currently, a retrograde approach is suitable for mid-to-distal ureteral cystine calculi when using high-energy modalities such as holmium:YAG laser or pneumatic shock devices (eg, Lithoclast). Smaller proximal ureteral calculi may also be treated in a retrograde fashion. The role of retrograde treatment of renal calculi and large proximal stones is less clear, although ESWL and percutaneous surgery are generally preferred for larger stones. However, one study reports 5 of 6 patients with renal calculi 1.5-3 cm in diameter who were successfully treated via a retrograde approach with intracorporeal electrohydraulic lithotripsy. Percutaneous nephrolithotomy is the criterion standard for cystine renal calculi larger than 1-1.5 cm in diameter and for calculi for which ESWL or retrograde surgery has failed. Ultrasonic lithotripsy readily fragments most cystine stones, although re-treatment rates are still approximately 50% compared with approximately 15% for other calculi. Stone-free rates after multiple treatments range from 40%-86%, although recurrence rates are high, approaching 50%-70% at 5-year follow-up despite postoperative medical management. For large cystine stone burdens, such as occurs with full staghorn calculi, multimodal therapy may help achieve better stone-free rates. So-called sandwich therapy involves initial percutaneous ultrasonic lithotripsy followed by ESWL and then repeat ultrasonic lithotripsy or flexible nephroscopy and laser lithotripsy. Direct irrigation of renal calculi with chemodissolution agents through a percutaneous nephrostomy tube was successful in treating a limited number of patients in the late 1970s and early 1980s. The two most commonly used agents were acetylcysteine (Mucomyst) and tromethamine-E (THAM-E). Acetylcysteine creates soluble disulfide complexes with cystine, similar to the action of D-penicillamine. In addition, percutaneous administration of alkalinizing agents can create a pronounced alkaline milieu. A solution containing 60 mL of a 20% solution of N-acetylcysteine and 300 mEq of sodium bicarbonate per liter of saline is recommended. Tromethamine-E is an organic amine buffer with a pH of 10.2. Treatment times range from weeks to months. Given the extended treatment times, relatively low success rates, and success of ESWL and percutaneous nephrolithotomy, this modality is rarely used today. Some urologists may still use chemodissolution to help achieve stone-free status in patients with fragments remaining after percutaneous nephrolithotomy or ESWL or for patients unable to tolerate surgery. Given the success of percutaneous nephrolithotomy, ESWL, and endoscopic retrograde approaches, open surgery is not indicated as first-line therapy for cystine calculi anywhere in the kidneys or ureters, with rare exceptions. Large bladder calculi may be amenable to open surgery, but these stones can also be treated with laser or electrohydraulic lithotripsy. Methionine: Instruct patients to avoid foods with very high methionine content, including stockfish and eggs, and to reduce their consumption of meat, fish, poultry, and cheese. One study reported decreased cystine production (by approximately 500 µmol/d) with reduced methionine intake. Low-sodium diet: Reducing sodium intake from 300 mmol/d to 50 mmol/d can decrease cystine excretion by 650 µmol/d (156 mg/d). Family screening helps identify patients with a genetic predisposition for cystinuria. Hydration sufficient to maintain urine output of at least 2.5 L per day is a well-accepted stone-prevention measure. Dietary restrictions must be instituted and followed. Urinary alkalization is necessary. Ensure that patients are following a diet low in protein and sodium chloride. Determine urinary pH level, and check first-morning urine for cystine crystals. Repeat 24-hour urinary cystine measurements until the cystinuric state is well controlled and stable. Check renal function regularly. Red blood cell, white blood cell, and platelet counts should be monitored for patients on D-penicillamine and tiopronin. Abdominal radiography and renal ultrasonography should be routine. Patients should be taught to use Nitrazine paper to check their urinary pH level and to try to titrate the medication and diet on their own. In addition, continuing regular follow-up is mandatory because of the relentless tendency of cystine stones to recur. Patients should have frequent clinical, radiological, and laboratory surveillance. Annually perform 24-hour urine testing and imaging for patients with stable disease.